Dr. Nancy Phan uses palatal expander, along with other dental-facial orthopedic appliances, to treat growing children who have unfavorable facial growth. She uses a palatal expander to treat cases with severe dental crowding and small maxilla jaw. Through expansion of the palatal sutures, spaces are created to resolve dental crowding, broaden smile arch, correct a skeletal constriction, and minimize the risks of teeth impaction in growing children. 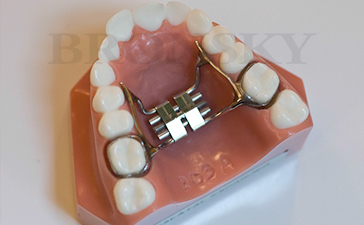 Dr. Phan uses palatal expander and other functional appliances such as a reverse-pulled headgear, Herbst appliance, headgear, or fixed bite corrector to create dental-facial orthodontic movements. Depending on the patient's skeletal and facial discrepancy, Dr. Phan will come up with a treatment plan to correct non-ideal facial growth and improve your child's face.